The Musketawa Trail is a 25 mile paved, multi-use recreation trail between Marne and Muskegon, Michigan. It passes through farmlands and wetlands, over creeks, and through villages. 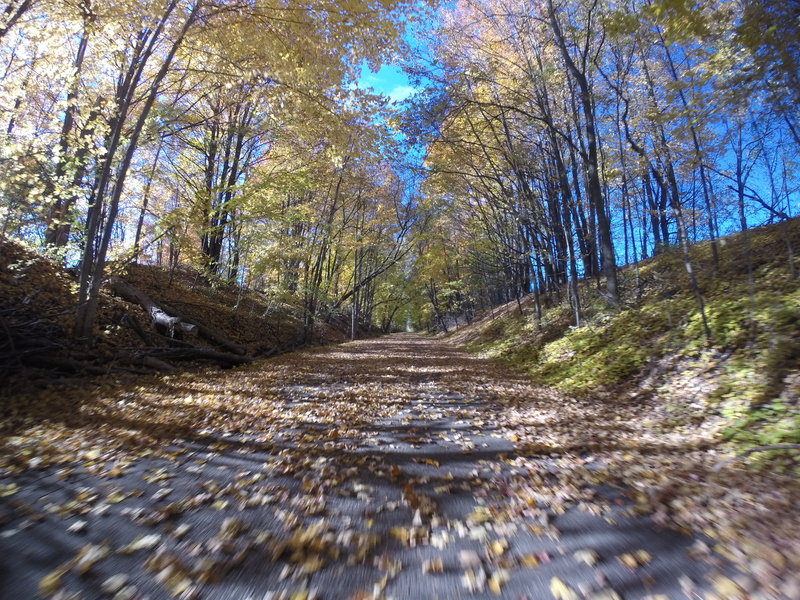 The Musketawa Trail is a 25 mile asphalt paved, handicapped accessible, multi-use recreation trail between Marne and Muskegon, Michigan. 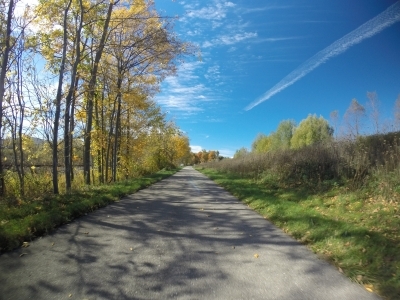 Completed in 2000, this heavily used trail is enjoyed by bikers, snowmobilers, horseback riders, rollerbladers, cross-country skiers, wheelchair travelers, hikers, and nature lovers. Scenery along the trail is varied. Leaving Muskegon you pass through light industrial and residential areas. Open fields of hay, blueberries, corn and cucumbers dominate the landscape much of the way to Ravenna which is generally considered the midpoint of the trail. Here you will find a replica of the old railroad water tower and the Crockery Creek trestle which rises 45 feet above the water. The eastern half of the trail is much more shaded as it passes through stretches of wooded landscape. You'll find the small village of Conklin about halfway to Marne. 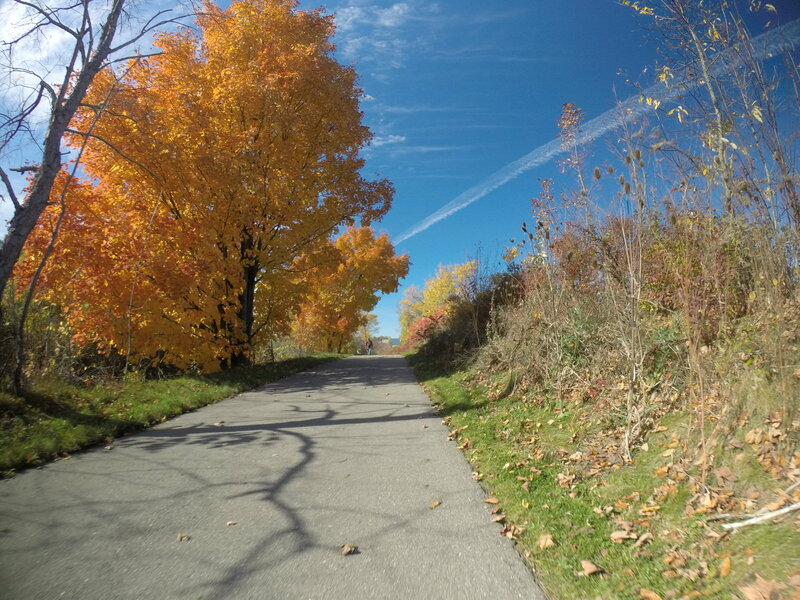 The Marne trailhead is in a rural area but there are long term plans to extend the trail to the east and connect with the other Grand Rapids area trails as a vital link in a statewide network. Future development on the Muskegon end will connect the Musketawa Trail to the Lake Michigan shoreline as well as the Hart-Montague Trail. The Musketawa Trail is a 25 mile paved, multi-use recreation trail between Marne and Muskegon, Michigan. It passes through farmlands and wetlands, over creeks, and through villages. The trail is a 4 season adventure for the outdoor enthusiast, living healthy and having fun. It provides a safe and natural environment for individual, family, and organizational use. 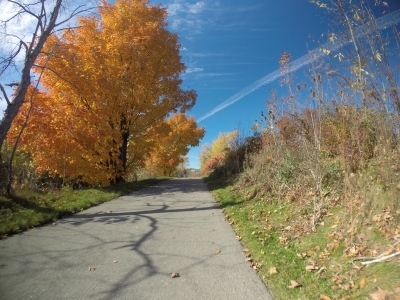 This trail is enjoyed by bikers, snowmobilers, horseback riders, rollerbladers, cross-country skiers, wheelchair travelers, hikers, and nature lovers. We hope that you will come and enjoy it with us! Colorful Autumn Day on the Trail. Photo by Jim Allan.